A unique collection of vegetarian, vegan and vegan-friendly hotels and guest houses from all over the world, made even more enticing by delicious recipes. The perfect gift for those who love healthy eating and sustainable travel. What is the use of the most beautiful rooms and an inviting pool, if you are referred to the side dishes in the restaurant? For vegetarians and vegans a holiday in a hotel can be a challenge. But there are excellent alternatives - you just have to find them. The travel journalists Thomas and Karen Klein also thought about this and invented 2011 toghether with their friend Peter Haunert the hotel cooperation and website VeggieHotels for 100% vegetarian hotels and b&b´s. In addition to the purely vegetarian-vegan hotels, more and more venues now offer their guests an excellent vegan cuisine next to their conventional dishes. The founders of VeggieHotels therefore devoted a special web portal to the most recommended hotels in this area in 2015: VeganWelcome. With their work, they not only made known some guesthouses that are run by enthusiastically-minded people, but also became pioneers of a tourism where ethical principles and sustainability are no foreign words. Their success speaks for itself: Today more than 300 hotels and guesthouses from more than 60 countries are members of VeggieHotels and VeganWelcome. Here guests can enjoy a new, creative vegetarian and vegan cuisine, which also satisfies spoiled palates. 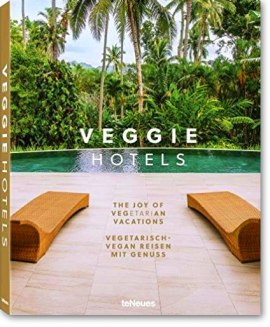 In this volume the best hotels of VeggieHotels and VeganWelcome will be presented with fantastic pictures and detailed information about their special advantages from cooking classes to yoga offers. The range of hotels ranges from trendy city hotels in the vegan hotspots of Berlin or London to the holistic health resort in Bali. Furthermore, kitchen chefs will reveal some of their favorite recipes, inviting you to start your culinary holidays already at home.